Longridge Town boss Lee Ashcroft was a happy man after watching his side claim another away win at the weekend. Town followed up their victory at Carlisle City in midweek with three points at Nelson thanks to Paul Turner’s hat-trick. Victory was achieved despite Town missing a number of players and Jay Hart only able to play as a second-half substitute. Ashcroft said: “Nelson is a difficult place to come; we had one or two of our so-called ‘star players’ missing but it gives the other lads a chance. The manager was also delighted to see Turner take his tally to eight for the season thanks to his second-half treble. He said: “Every credit to young Paul; that’s what he’s in the side for, to score his goals, and it was a great hat-trick from him. “I’m made up for him because he’s a great kid and he’s doing really, really well. “Paul’s been at the club since the summer; we have put him on a contract. “That’s how highly I rate him and I know that he could play a lot higher. “He’s only young, he’s learning and he’s got some good players around him that will make him become a better player. 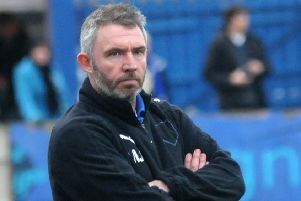 The win against Nelson marked Town’s eighth away win in a row. However, after Wednesday’s Lancashire Challenge Trophy game against Colne, they do not have a league game until meeting AFC Darwen on November 17. Ashcroft said: “We’ve just got to keep our feet on the ground, we have two weeks until our next league game so it gives the injured lads some time off.